Ira Barnes Dutton was born April 27, 1843 on a family farm in Stowe, Vermont, son of Methodist parents Ezra Dutton and Abigail Barnes. His family moved to Janesville, Wisconsin, four years later. In 1861, he enlisted with the 13th Wisconsin Infantry and served in the Union Army during the Civil War as a quartermaster, as well as nursing the wounded and burying the dead. He was discharged in 1866 as a Captain, but stayed in the South tracing missing soldiers, collecting their remains and settling survivors’ claims. This and a failed marriage led him into alcoholism, and by his own account he spent the next decade in a drunken stupor (“I never injured anyone but myself.”) When he emerged from the gutter in 1876, wanting to do penance for his “wild years” and “sinful capers,” he began to study religion and in 1883 joined the Trappist Monastery at Gethsemane, Kentucky. Brother Joseph taught the children the games he had played as a child. 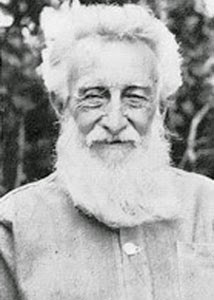 Molokai became very proud of its baseball teams, coached and uniformed by Brother Joseph himself. A couple interesting side notes relate to Brother Joseph and Stowe, Vermont. After fleeing Austria in 1938, the von Trapp family (Trapp Family Singers (of Sound of Music fame; refugees from pre-war Austria)) bought a farm in the mountains of Stowe in 1942 and made it their adopted home. When the town was looking for a site for a new church, Maria von Trapp, the family matriarch, provided support for acquisition of land and building of the Blessed Sacrament Church (they purposefully purchased a portion of the Dutton’s former farm where Brother Joseph was born.) The first mass was held on March 6, 1949. The church windows, walls and ceilings were painted and decorated by internationally renowned French artist Andre Girard. Twelve exterior panels depict the life of Damien and Brother Joseph at Kalawao. The church and its panels were recently restored. The image shows Brother Joseph. In addition, I have added other images in a folder of like name in the Photos section on my Facebook and Google+ pages.